I just read about a man exploring prayer who would take out his iPhone, scroll through his contacts, and see which names jumped out at him — indicating people in need of his prayers. “Cool!” I thought. What a wonderful marriage of technology and prayer. I tried doing it and found myself scrolling through my list of people, fretting about those I may have disappointed in myriad ways, worrying about family members facing health challenges, and wishing I could help friends unable to find jobs in this still wobbly economy. As a writer, my mind tends to go galloping off in too many directions when I look at words and names. Perhaps images would work better for my restless, ADD mind. 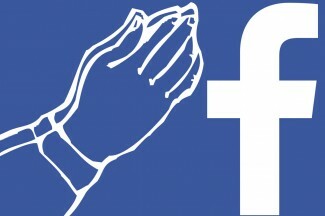 Then inspiration struck: Let’s scratch the contact list and try praying through Facebook. That sounded promising, even holy. I went to my Facebook page, and each time my thoughts wanted to veer off in an unexpected direction, I brought them back to the image before me — not the postings of friends at the beach, sipping wine, having a first date after the birth of their child. Not those; but simply praying over the profile picture to the left of the posting. I went to my Facebook page, simply praying over the profile picture to the left of the posting. This was an interesting endeavor. One photo jumped out at me, becoming more vivid as if my friend were sitting across from me at a table. I imagined her there drinking “Dark Magic” coffee and telling me things I knew about her life. This was an interesting endeavor. One photo jumped out at me, becoming more vivid as if my friend were sitting across from me at a table. I imagined her there drinking “Dark Magic” coffee and telling me things I knew about her life: its difficulties; the problems she is having with her toddler and his reluctance to embrace either language or potty training; her joy that her husband has found a job he likes; and a bittersweet longing about her sister who is leaving town to go to grad school across the country. I lifted her up in prayer. I asked God to come to my friend who lives too far away and give her strength and patience while she trains her toddler. I asked God to help her find ways to stay in touch with her sister. And I sensed something else — that she was lonely and in need of more friends. Please send her a friend. And then, let me be that friend. I did not propose any solutions (always my failing, wanting to rush in with perfect answers.) I just asked God to be present to this woman in the way she most needed and to know that I was loving her at the same time. I promised silently that I would both e-mail and phone her more often. This was just one person who stood out for me in need of prayer. I’m not sure what I would do if I found that I should lift up 10 people, though that is not impossible. To some this may seem impersonal, but I felt as if I had made contact with my distant friend in a new way and that praying over her picture had joined us more closely, bearing fruit as I vowed to be in better contact with her. 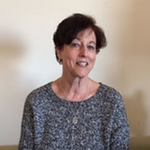 Ann Turner is a passionate convert to the Catholic faith, who is also passionate about life in general, small dogs, food and wine, friends, nature, and the blessing that comes from just showing up and being a witness with other people. Ann is also the published author of more than 40 children's books. Follow Ann's faith journey and more at her blog.